One famous, mysterious, prolific (and sometimes controversial) Finn called Satanic Tyrant Werwulf is apparently determined to explore just about every nook and cranny of NWOBHM in addition to his black metal exploits (of which Satanic Warmaster is probably the most well-known). How else do you explain the emergence of Heavy Cross in addition to his other traditional metal band Armour? Both bands being represented by non-conformal Hells Headbangers label, the aforementioned nooks and crannies are apparently different between Armour and Heavy Cross. If the former is more of what I would consider to be a jovial party metal along the lines of Accept, then Heavy Cross is most definitely a homage to mid-to-late 70s Judas Priest and Saxon, psychedelia shaken off and rock balls beginning to grow. Only time will show whether a quick 2-track EP is going to lead to something bigger, but Street Wolf is 8 min of simple (easy for me to say, since I never composed music in my life), catchy and riffage-driven fun. Predictable guitar gallops and melodies, along with predictable lyrical themes, do not diminish the enjoyment one can get from this EP. The title track is more flowing and weaving, almost subdued in its melody outlook, especially when acoustic mid-point comes forth. Adding almost dreamy and dazed vocals and thin-line production fits the retro formula of Judas Priest on Sin after Sin and Stained Class. Red Light Woman is a more straightforward rocker, with chopped up chuggin' chords, and a little more flashy on the exterior. Street Wolf, the track appeals to me more on personal level since I never had a huge taste for catchier crowd pleasing rocker hits, but neither song is atrociously bad or superbly good. If you went to high school around the end of 70s or early 80s, you can use this EP to relive the past. 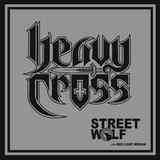 If you wanted to hear what your parents or older siblings were listening to 30 years ago, this EP can be a precursor, but then so much more retro metal is coming out lately Heavy Cross is hardly unique. This one is squarely in "we'll see what happens" territory.